A select form of Lilium speciosum rubrum, the named variety 'Uchida' is probably the one most commonly found now in commerce. Protected by Hirotaka Uchida and his eldest son Machao during the war years, they had been ordered by the Imperial Japanese Government to destroy their ornamental plant farm and to grow potatoes for the army. They defied those orders and kept bulbs of 'Uchida' hidden throughout the war years. 'Uchida' was awarded a gold medal at the 1963 Internationalle Gartenbau Ausstellung in Hamburg, Germany, as they say, the rest is history. 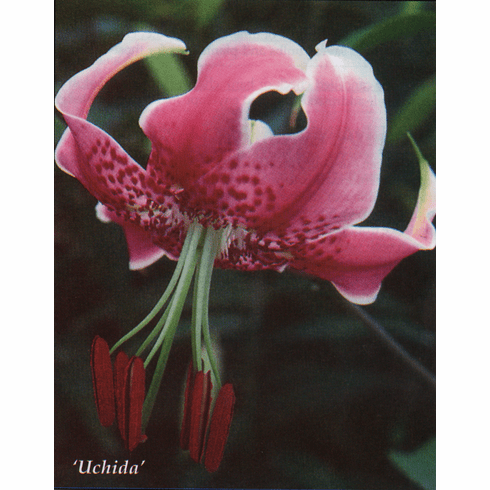 Inset #1 is of another Lilium speciosum selection named 'Cinderella' selected and named by F. H. Wilson circa. 1950. Insert #2 of of L. rubrum "type" which is most commonly found in commerce. Insert #3 is of L. speciosum rubrum var. Magnificum which received an Award of Merit in 1903 from the Royal Horticultural Society. This Edgar Kline photo was provided by Bill and Mary Hoffman. Insert #4 is of L. speciosum rubrum var. "Melpomene' raised and named originally by C. M. Hovey of Boston, MA in 1884. This photo is from Edgar Kline as provided by Bill and Mary Hoffman. Insert #5 is of a Boyd Kline flowered form of L. speciosum rubrum var. punctatum. We believe this was first introduced in the late 1800's. Photo from Bill and Mary Hoffman.